To end a busy week and help lead us into the weekend with some downtime (a term I had never heard until technology made its play on our time), I’d like to call out two things to help focus us away from gadgets and devices. The first relates to this great little photo (on the right). A crowd has gathered to watch a parade, a celebrity or some runners and everybody has jumped to their phones to catch the moment. 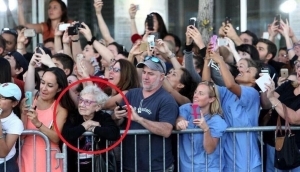 But isn’t it interesting that nobody is actually watching the event unfold, nobody except one little old lady who is very content to take in that special moment. The look on her face speaks a thousand words. Occasionally, leave your phone in your pocket and just be present. The other item relates to something I posted on social spaces earlier in the week that received a most positive reaction – handwritten notes. Despite all the wonders of technology most electronic communication lacks the personal touch and if valued, lasts only a short time. Instead people truly value and often keep a handwritten note. I first read this during the 1990s when a famous rugby coach left handwritten notes under the door of each team member before a crucial game. It rallied the troops to great success. So go on, send somebody a ‘Thank You’ note today. It will please you as much as it does them.